Maldives Promotion House – The soft sandy beach glows in the moon light. Suddenly something washes ashore. Slowly it pulls itself onto the beach and begins to crawl. With two flipper-like projections, it pulls itself towards the tree line. 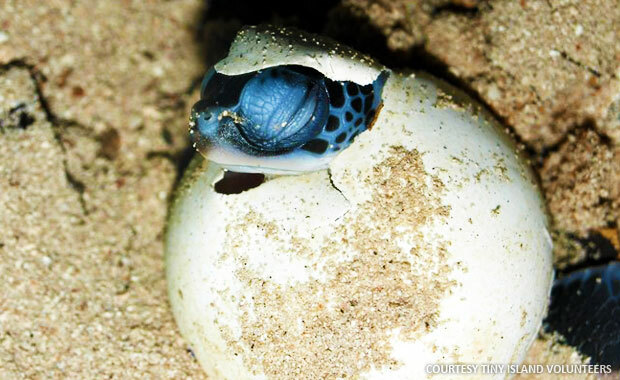 It is a sea turtle, visiting its birthplace to lay the eggs. Turtles can take about 10 to 15 years to reach breeding age, and in many cases they breed every few years rather than annually. Sea turtles lay their eggs on dry, sandy beaches and immature sea turtles are left to learn and survive among the powerful predators. While crabs and sharks are among their most common predators, birds also feed on hatchlings. Large numbers of eggs are deposited in holes dug on the beach which are then covered and left to incubate. After hatching, the young turtles squirm their way to the surface and head toward the water, attracted to the sunlight reflected by the sea. While turtles spend large amounts of their lives underwater, they breathe air and must surface at regular intervals to refill their lungs. This also allows them to live on land for long periods of time. Maldives is home to five species of turtles. Green Turtles, Hawksbill Turtles Olive Ridley Turtles, Loggerhead Turtles, and Leatherback sea turtles have all been seen in Maldives. However leather back sea turtles have not been known to nest in Maldives. 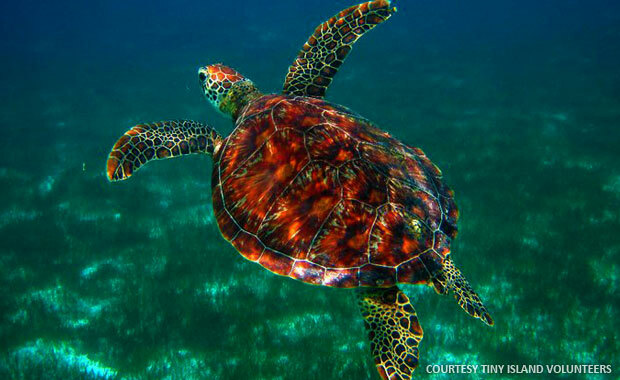 In its efforts to save marine turtles, a law was earlier introduces which prohibited poaching. However the law expired after 2005 and poaching was and still remains in some islands as common practice. The decision was made on 21st June 1995 to prohibited catching or killing of any marine turtle species. 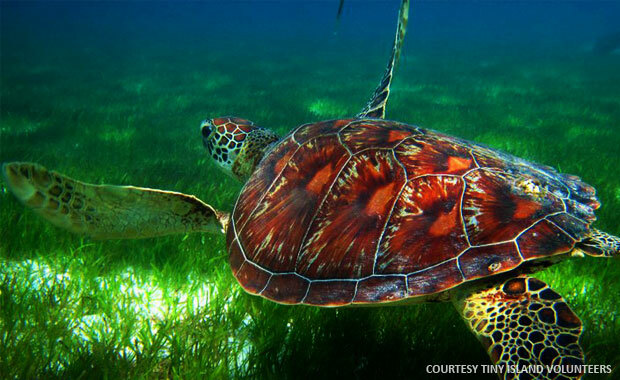 Though their sale, import and export of its products was banned for ten years, turtle eggs and nests were not protected under the ban. Tiny Island Volunteers is a company registered in the United Kingdom and involved in turtle conservation. Founded by Mauroof Khaleel and his wife Hana Thompson, the organization was initially geared towards bringing in foreign volunteers like teachers, aerobics instructor and coaches. 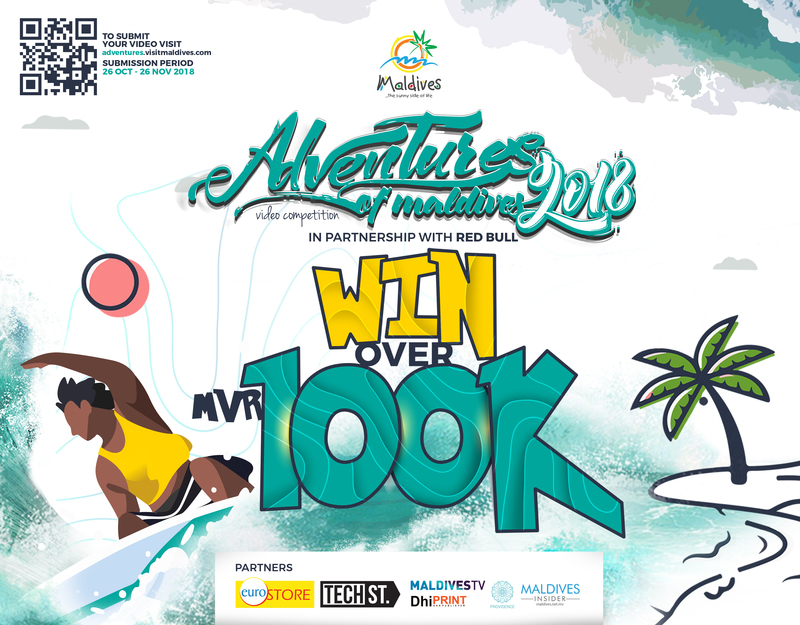 Tiny Island Conservation is their Maldivian Non Governmental Organisation which the programme runs through, in collaboration with other island NGOs like Naifaru Juvenile. 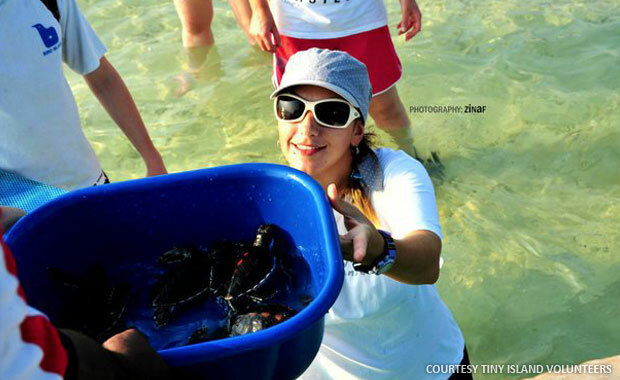 The marine conservation project which began recently has been their most successful project. With their own marine biologist they aim to create awareness among the younger generation to conserve the endangered turtles. The organisation is based in Lhaviyani Atoll Naifaru, where they have their own Marine Conservation Centre. Volunteers are granted the opportunity to help the community in many ways including teaching the young students of the island. They also participate in activities such as snorkelling and beach patrol. 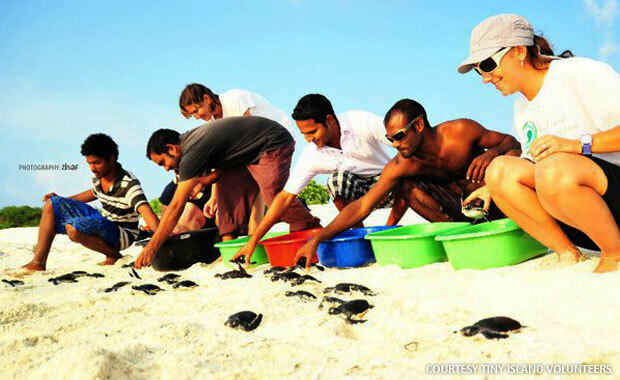 “We conduct beach patrols on Lhaviyani Dhidhoo, which is one of the best turtle nesting spots in the area. We look to see if any turtles nested on the island, or if any nests have been damaged. But unfortunately the government has given that island for resort development, it is sad,” Mauroof said. “But we are certain that even on Dhidhoo none of the eggs survive, because the island is famous among poachers too. They hunt the turtles and take their eggs, which are then sold for Rf3 each. We want the public to be more aware, especially children. We want them to know that turtles are not pets,” he added. While a full survey about turtles in Maldives hasn’t been conducted yet, they have conducted minor surveys on some five islands of Baa atoll and some other atolls, to gather statistics on nesting and survival of the turtles. 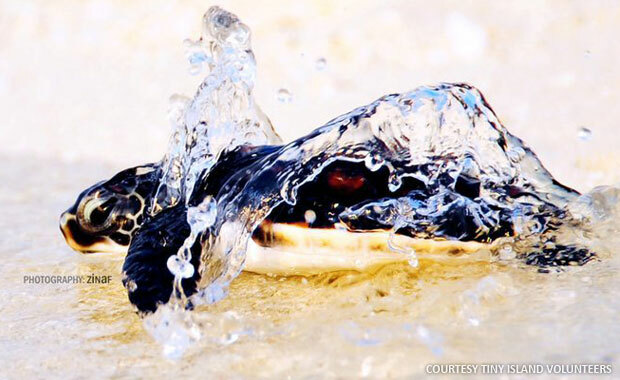 “Poachers and those who feed on turtles should be taught that turtles can be toxic. 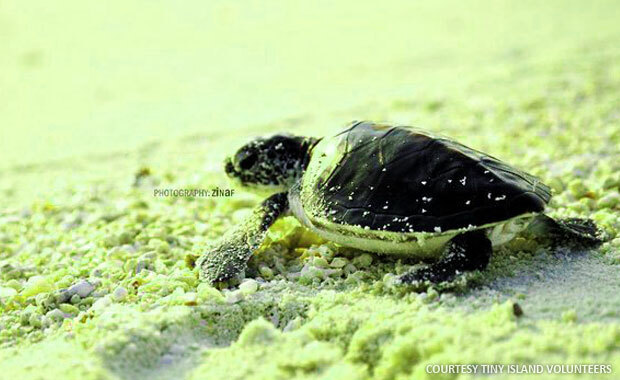 Turtles feed on seaweed which has a substance that is toxic to humans,” Mauroof noted. Apart from their Marine Conservation Centre, they also have a Sea Station where they keep the turtles until they grow to a certain age. The turtles are usually kept for about a year to increase their rate of survival before being released into the wild. “We keep the turtles at the Sea Station, to allow them to recover and grow. We want to increase their chances of survival before we release them into the ocean. 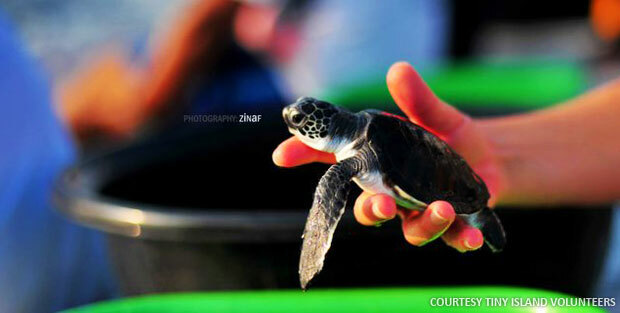 The turtles are looked after by our marine biologist,” Hana said. 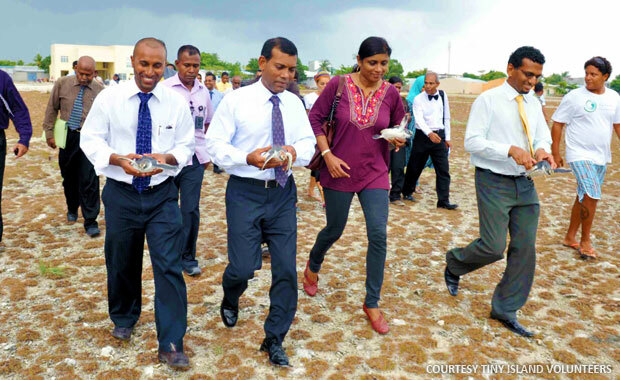 President Mohamed Nasheed recently visited the conservation center. During the visit he was briefed on the turtle conservation programme. The President also released a turtle from the first batch of turtles in the nursery to the sea station, where they will grow until the turtles would be released. Within the past eight month the program has received so much support that they have brought in over 40 volunteers. Volunteers can stay for a maximum of three months. “We are actually expanding the programme in the next few months to Velidhoo, as we want to spread the conservation message as far as we can. Currently we have a great centre and team in Naifaru that runs through the joint NGO, Tiny Island Consevation, in partnership with Tiny Isand Volunteers. So Naifaru Juvinile will also team up with Velidhoo Future Foundation,” Hana said. 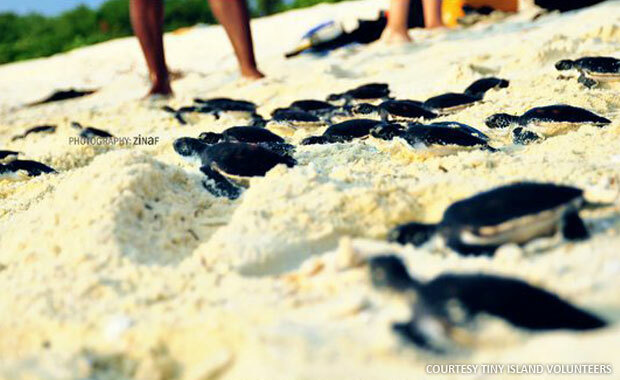 According to Mauroof they are planning on pursuing for a legal act to protect turtles and their eggs. Their hard work is already producing results, as an increasing number of fishermen and children have begun to hand over turtles caught in nets and kept in captivity. While we mark the World Turtle Day today, we at Maldives Promotion House support their attempts to conserve turtles and to expand their efforts. We wish them luck and will support them in every way we can. We want the Tiny Island Volunteers to know that we understand that turtles are neat and not meat. 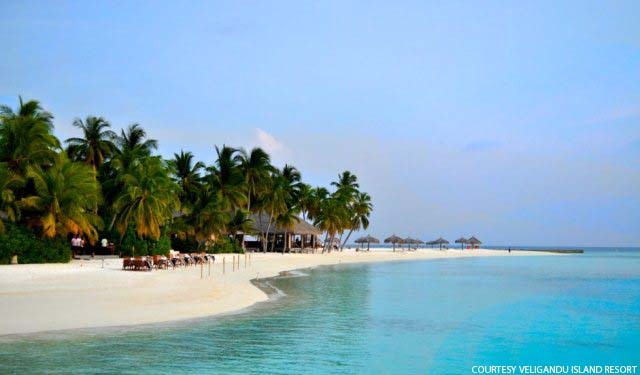 Almost every local island in Maldives is blessed with a sandy beach, a lagoon and a house reef. Would it not be nice, to one day witness the turtles emerge from their shells into the embracing freedom of the sea? Would it not be blissful to see their little black heads pop out of the sand, and to know that you helped them achieve their rightful place among other thriving species? Their flippers flapping. Their tiny little bodies wriggling towards the sea. To return long after you have aged, to lay their eggs for the next generation to witness.